This is the twenty-third in a series of posts that report on the state of the parties as measured by opinion polls. By pooling together all the available polling evidence we can reduce the impact of the random variation each individual survey inevitably produces. Most of the short term advances and setbacks in party polling fortunes are nothing more than random noise; the underlying trends – in which we are interested and which best assess the parties’ standings – are relatively stable and little influenced by day-to-day events. If there can ever be a definitive assessment of the parties’ standings, this is it. Further details of the method we use to build our estimates of public opinion can be found here. We last reported on the state of the parties in the aftermath of the Eastleigh by-election. 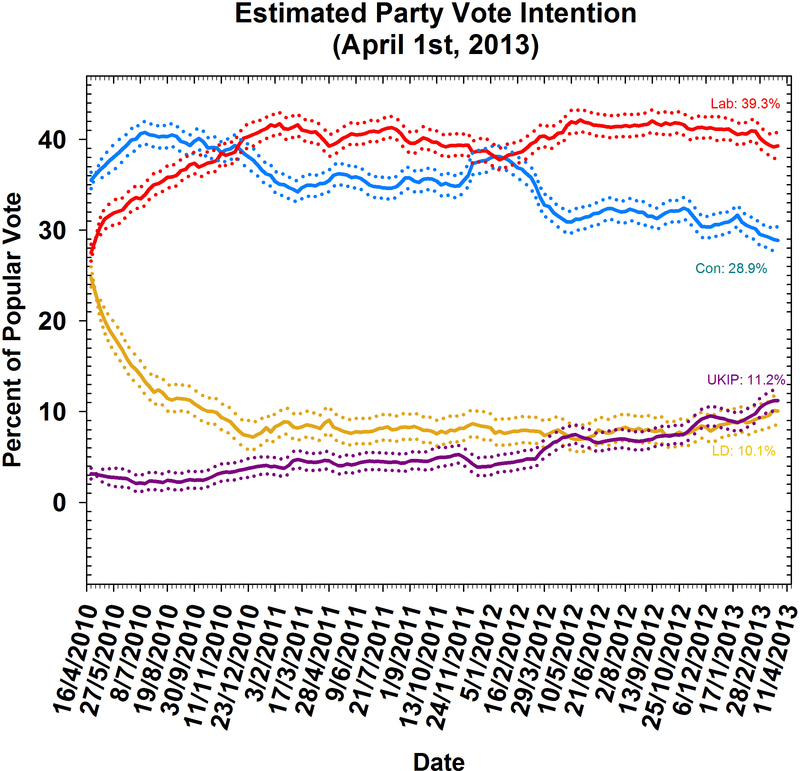 This month’s Polling Observatory update relates to poll data collected before the death of Baroness Thatcher. This is a momentous political event in British political history, whatever your view of the Iron Lady, but one that we would not expect to have any lasting consequences for voting intention. Instead, voters’ responses to Thatcher are likely to be a function of their present and past political leanings so her death is unlikely to change the political weather in quite the same way as she did when she was alive. The estimates of vote intention for the month up to the start of April reflect many of the patterns that we have observed in the past quarter: with UKIP and the Liberal Democrats on the rise, while Labour have fallen back slightly from recent gains, and the shrinking of Conservative Party support continues to what must be worrying levels for its leadership and the parliamentary party. Last month support for the Conservatives fell from 31.9% to 29.9%, and they have hit new depths this last month, with their support now standing at 28.9%. This is not far off some of the wretched poll ratings they achieved in opposition, under Hague and IDS, against another divisive political titan, Tony Blair. Labour has fallen back from its gains last month, from 41.2% to 39.3%, but retains a healthy lead which would see it swept to power with a sizable majority if the election were held now. Both the Liberal Democrats and UKIP continue to make gains at the expense of the main parties. This month support for the Liberal Democrats has risen to 10.1% (from 9.1% in March), while UKIP has seen an even bigger rise in support from 9.3% to 11.2%. These parties are making gains against the larger parties for rather different reasons. The Liberals Democrats may be benefitting from a subtle shift in distance away from their Coalition partners, with more visible splits becoming apparent on a number of policy issues, while UKIP’s message continue to resonate with voters who are concerned about immigration and generally disaffected with the mainstream political elite. Thatcher left many legacies, and now is arguably not the best time to debate them, but it is clear that the Conservative Party has never been quite the same since their act of matricide in November 1990. While they recovered briefly under John Major to win the 1992 general election, they have never achieved the same electoral dominance that Thatcher did. Thatcher was a brilliant rhetorician, but perhaps too many of those who followed her too easily lapped up the myths as well as the realities of her government and its policy achievements and electoral success. Whereas New Labour clearly learnt the lesson of the importance of party discipline and pragmatism from the 1980s, the post-Thatcher Conservative Party has become more ideological and less disciplined, as exemplified in the bizarre murmurings over the prospect of replacing David Cameron, the first Conservative leader in a decade to make them a competitive electoral force, even if he was not able to win a majority against a deeply unpopular incumbent. Competence and party unity remain the key criteria on which the Conservative Party will be judged by voters in 2015, areas in which Thatcher’s legacy is mixed, if one puts down the rose-tinted spectacles for a moment. Reblogged this on THE POLLING OBSERVATORY.